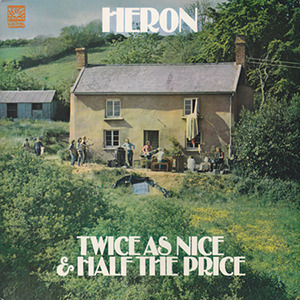 When we first posted on Heron, the obscure British folk group from the early 70's, Jeff Thorpe wrote that after attempting to research the group (and coming up empty handed), that perhaps he was content to leave their biography a mystery and let the music speak for itself. In truth, even if one would like to dig deeper, when it comes to Heron it is not a matter of preference, but rather, a true lack of information. Aside from a few band members’ reflections – found on an otherwise completely sparse website – there is very little history to be found. 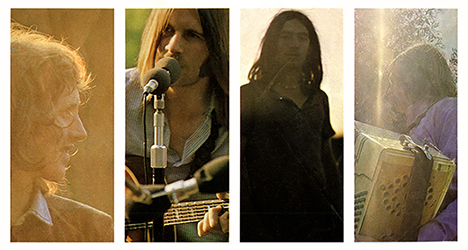 [...] Recently, we were lucky enough to track down one of the albums by its lonesome, abd listening to it as an individual document proves that the painfully overlooked group was crafting a remarkably unique sound that feels both new and yet very familiar. The record is Twice As Nice & Half the Price. An album in which songs of jolly demeanor (“My Turn to Cry,” a driving song with the heaviest drums on the record and sung like a smiley pop orchestration) are mixed into the record seamlessly between solo-efforts and quiet introspective works. Two of the LPs most devastating tracks are both covers. The Isley Brothers “This Old Heart of Mine” is reinvented to reflect the forlorn nature of the lyrics. Dylan’s “John Brown” can be added to the short list of tracks whose cover version is stronger than the original. A war-commentary originally penned in 1963 and mostly forgotten until it’s appliance in an “Unplugged” setting, it is sung here in a beautiful harmony that is far from perfect, with a jangling but not up-front piano. It’s this looseness that makes many of these tracks feel like old standards instead of originals. Jovial, yet sad songs that blossom with the raw emotion of single-takes. This is non-abrasive, “easy” folk of the highest caliber, allowing the listener to either get lost in its lyrics, the instrumentation, or the Sunday-afternoon delight.